Bioteknolohiya para sa Kalikasan, Kalusugan, Kagandahan, Kabuhayan at Kaunlaran. 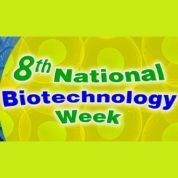 The National Biotechnology Week (NBW) has been held during the last week of November for the last few years. Though there has not been any official schedule yet of the next NBW, it would most likely be still in November. Kindly await for any official announcement for the next NBW in the months to come.